Caldey Island TownCaldey Island lies cradled in the magnificent South Pembrokeshire coastline on the western fringes of Wales. It is one of Britain's holy islands. The Cistercian monks of Caldey continue a tradition which began there in Celtic times. More than a thousand years of prayer and quiet living have made this remote and beautiful island a haven of tranquillity and peace. The monks and islanders of Caldey are pleased to welcome day-visitors to share the delights of their island home throughout the summer season. A pleasant boat trip from Tenby Harbour takes you to this beautiful and fascinating island. 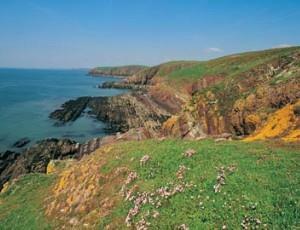 Caldey has been inhabited since the Stone Age, and has been home to various orders of monks since Celtic times. It is now owned by monks of the Cistercian Order, whose picturesque monastery overlooks the Village Green and the pretty cottages of the islanders. You can explore the historic Old Priory and the medieval churches of St David and St Illtud, or join the free guided walk for a closer look at the island's heritage. You may like to drop in at the Video Centre to find out more about life in the Monastery. Visitors are also welcome to attend the one of the short chanted services in the Abbey Church, which form part of the daily prayer life of the monks. In the village you can buy the perfumes, chocolate and shortbread made on the island. The Village Post Office is also a museum giving an interesting insight into Caldey's history. Postcards and special covers are franked with the Caldey Island handstamp. A walk up to the Lighthouse opens up spectacular panoramic views of the Pembrokeshire Coast, Tenby and the Preseli Hills, the Gower Peninsula and Lundy Island. The monks and islanders of Caldey are pleased to welcome day-visitors to share the delights of their island home throughout the summer season. The Cistercian monks of Caldey continue a tradition which began there in Celtic times. Boats run Monday to Friday, from Easter to the end of October. Also on Saturdays from May to September. The Island is closed on Sundays. Sailings approximately every twenty minutes from approximately 10am to 3pm. Last return boat usually 5pm. Note: Times and open days may vary. At high tide boats leave from the Harbour and at low water from the landing stage on Castle Beach. Tickets are obtained from the Caldey Island Kiosk at the top of Tenby Harbour. The ticket price includes return boat fare. You can travel and return on any boat. A Park and Ride bus is available from Tenby's North Beach Car Park to the harbour when the Tenby pedestrianisation scheme is operating (School summer holiday period). Car parking is available in Tenby, at the Multi-Story Car Park, Salterns Car Park and North Beach Car Park - pay and display. All are within 10 -15 mins walk from the harbour.